Scrap Fabric Friendship Bracelet Tutorial + SEWING MACHINE GIVEAWAY! 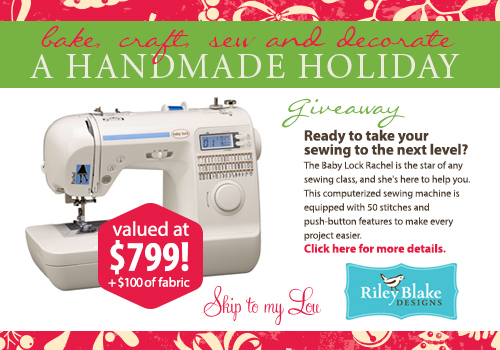 The giveaway includes two things I LOVE: BabyLock and FABRIC! Riley Blake Designs colorful fabrics include cottons, flannels, sparkle cottons, organic cotton, knits, dreamy, and laminates. RUFFLES 2012 sewalong introduction + signups august giveaway winner the house smells like mod podge who loves grape soda? I don’t think I have received a homemade gift in a long time, however my mom has given me the tools needed to make things. She bought me my first sewing machine, gifted me money to help me save up for my new one, and bought me my serger. Sewing has been a sanity saver since I became a stay at home mom. The best handmade gift I ever received was a quilt my sister made with a giant Hello Kitty appliqué on it. I love it so much! A wilted table runner as a housewarming gift. I’ve also received hand knitted hat that I love! The most hand made gift i have received was an appliqued, hand pieced, and hand quilted quilt from my mother as a wedding gift. It was a beautiful blue, which is my favorite color!! i have loved barbie my whole life, and a friend once made me a personalized barbie of myself, complete with custom handmade wire whisk and other baking accoutrements… amazing! thanks for the giveaway! My favorite handmade gift was a sewing machine cabinet my husband made for me one Christmas! It was the best. A few years ago my mom made me a quilt made from our old clothing items, including my favorite outfits from middle school. It’s so beautiful and so meaningful! I love the handmade quilts that my best friend has given our family! My one friend sent me a beautiful pair of handmade earrings. I wear them all the time. I received along necklace from a jewelry-making friend, and it goes with everything I wear. She even made the chain herself. It was the best handmade gift that I have ever received. The best handmade gift I ever received was a quilt made by my grandma! Best ever handmade gift ever…has been the quilt my Daughter made…& brought home (she lives in NC….& I live in OH) to give to me, while I was doing Radiation for 7 weeks..daily… away from Home. She wanted me to have “Daughter Hugs” with me thru the process. BEST Hugs ever!!!! :) I am Blessed! My favorite homemade gift was a book written and illustrated by my daughter. It was so heartfelt and she spent a month working on it. Gifts from children are the best, because they don’t always have money to buy a present or supplies. So they give you everything they have instead. Anything from my sister- she’s super talented and so creative she pretty much never uses a pattern! I look forward to her gifts every year!! The bracelets are lovely! This might be a good gift for my niece. Thanks for sharing. The gift I have received is a cross stitch of my home. Made by my mother. Oh the new machine looks wonderful. The best hand made present i received was bead crocheted necklace, it was stunning! I love the crocheted baby blankets I received from my great aunt for each of my children! One year my mom made me a crochet granny square afghan. I still enjoy using it. Hands down, it’s the crocheted bedspread and afghan set my mom made me. I know how many hours she put into it and I know how much she enjoyed putting love into every stitch. One of my students gave me a scrap wood TexasA&M piece that he had made in art. The best handmade gift I ever received was one of my niece’s drawings. Thanks for the giveaway! i love quick, easy and cute gift ideas; especially this time of the year. the best homemade gift i have ever rec’d is a all handmade quilt from my mom. My best friend had made me a ton of awesome & unique gifts plus my daughter has figured out those are always my favorites. I can’t pick just one. I’ve received 2 handmade quilts in my life and they are both treasured. The best gift I’ve ever gotten is artwork from my children. No one can be more joyful givers than sweet little children! My mother recently gave me a baby blanket that she made for me when I was a baby. I am 40 years old so that was pretty awesome. Have a great day! Good luck to everyone in the giveaway. My mom made me yoga pants which was great because I have a hard time finding pants that are long enough! My mom gifted me the most beautiful quilt from my great grandmother. It’s absolute perfection! The best hand-made gift I’ve ever received is when I was about 8 years old. My mom had broken her ankle was instructed to stay off it as much as possible. It was winter, she had 7 other kids and Christmas was just weeks away….Since she couldn’t go shopping, she hand-stitched each of us a pair of pajamas. The neighbor lady helped to cut out the pieces, but Mom made every loving stitch, including the buttonholes! What an awesome tutorial and give away! The best home made gift I ever received is from my husband. It is a special and very detailed card that he gave me just before we got married. Ive gotten plenty of amazing home made gifts, but nothing can top the sentiment behind his card. best handmade gift I ever received was my son’s handprint in plaster when he was in kindergarten. He was so proud of it! He has a slight curve in his little finger and that handprint made his uniqueness so very clear to me that day. The perfect sized weekender duffle bag! Love the cute bracelets. Great way to,use up fabric scraps. What a fun project to kick start the making season! And an awesomely generous giveaway! Thank you!!! My favorite handmade item, is anything my mother makes me. She is so talented and I know everything she makes all of her heart and love is put inot it. I will always cherish what she makes me! Those friendship bracelets are adorable! My favorite handmade present has always been quilts. I am lucky to have a number of them! I have a beautiful crocheted bright afghan, queen size, that a friend made me. I love it. my mother made for me a white jersey shirt + pants when I was 14. I loved them and used them SO many times!!! The gifts my children made for me when they were in school. I love those Christmas ornaments and mother’s day cards, the things they made out of clay in art class.Those are the best! A hand-made basket from one of my dearest friends! The best hand-made gift(s) were both made by my husband – one was a papercraft gear puzzle that formed a heart when the gears were rotated, and the other was a treasure chest made from chocolate bar wrappers (LIndt Boxes) that had a papercraft “Awesome Sauce” bottle inside because he says that’s what I am. My aunt is an avid quilter — so she has made each one of us nieces and nephews a quilt — incredible! The best handmade gift I have ever received was a flannel rag throw quilt from my friend for my birthday a couple of years ago! The best handmade gift I have ever received is a necklace my oldest daughter made me. It is made with yarn and has about 3 random things on it. Like a button and some random charms. She made it for me for Mother’s Day and it is so sweet. My daughters Christmas stocking, which was needlepointed on the front and then sewn lined with a velvet back. It is just lovely. The best handmade present I’ve received was a Christmas stocking from my grandmother. I still decorate with it each year. The best hand made gift that I have received is a pair of slippers that are made out of a towel – the most comfortable slippers I have ever owned. Thanks! the best handmade gift I have received would be a quilt from my mother but my family all do handcrafts so there are many other handmade things that are precious to me. Best handmade gift I ever received was from my daughter- it’s a portrait of our family that she drew. I think she’s a pretty good artist and loved that she put so much time and effort into each detail. I framed it and it sits next to my craft area. The bracelets are fantastic and what an amazing giveaway! The best home made gift I ever received is a special and very detailed card my husband made for me. Nothing has been able to top the sentiment behind this card. The best handmade gifts came from my kids -no adult around me is crafty amnyway… A wooden napkin holder from my daughter and a self portrait from my son. What a hand thrown pottery bowl! The best handmade gift I have ever received was a knit Christmas stocking my mom made for me. In case of emergency break glass box containing a diet coke, made by my nephew. Greatest gift ever! I love my sister’s homemade apple butter every year!! My grandma always made apple butter around the holidays and it is a nice way to remember her. Such cute bracelets! Thanks for sharing. Can’t wait to see the the other gift ideas! My favorite handmade gift was a blankie my mom made me a couple years ago. I LOVE blankets! What cute bracelets. Just in time for Christmas gifts!!! A friend made a little bathrobe for my daughter. It was adorable! I don’t tend to get very many homemade gifts. But my mom has made me a few aprons. You are so awesome! I don’t think I have reasd anything like that before. Really.. thank you for starting this up. This site is one thing that’s needed on the web, someone with a little originality! Fab idea! Great for daughters to make for school friends for Christmas! My mom has made me a few quilts that I love! I received many cross-stitch designs as gifts over the years – when moving into a new home or as a wedding gift. I love them because they are a handmade item I can put out for all to see and I know they are appreciated by everyone. My Grandmother would make me a rag doll every couple of years when I was a little girl. I still have most of them. My favorite homemade gift is a quilt made by my mom. The best handmade gift I’ve received was from my husband. I made no sense to anyone else, but it was a piece of modern art! I love it! My father made me a black walnut yarn swift for Christmas one year. He now has a black walnut allergy, so I treasure this! The best handmade gift I ever received was a counted cross stitch wall hanging from my best friend. My grandmother used to knit and one Christmas she gifted all the ladies in the family scarves. BTW These bracelets are great! My mom made my wedding bouquet. It was the most beautiful part of my wedding. The Best handmade gift I ever received was a letter from my daughter who is 5. She drew me a picture of my face, and wrote her name underneath it. I treasure it simply because she thought of it on her own, and it came from her heart. The second best handmade gift I ever received was from my 6 year old nephew who made me a “#1” badge after spending almost all his waking hours with me at a family reunion. He was my little “Bude (Buddy)” and he wanted me to know that I was his number 1. It’s going in a frame on my wall, right next to the drawing of my face that my daughter did for me. A beautiful handmade thank you note for something that was no big deal to me, but it was to the other person. I’ve never really gotten hand made gifts unless you count baked goods. My daughter loves to make and give me things- they are always sweet notes attached. The best gift I ever received was a quilt made by my grandmother. The best handmade gift I received is a hand sewn hand quilted quilt from my dh’s grandmother. Thanks for the cool contest. The best handmade gift I received was my wedding veil. Cute twist on friendship bracelets! Ehrmahgerd. Those bracelets are awesome! And what a fabulous giveaway. Thanks! I forgot to say that the best handmade gift was a poem from my daughter when she was in kindergarten. I don’t receive many handmade gifts, but I love to give quilts. For babies, birthdays, and special events. I have given quite a few over the years, but only got one quilt in return, for my 4th son; not even my only daughter!!! What a fun machine to do some sewing and quilting for my grandsons! Thanks. My grandmother and grandfather collaborated to make my favorite handmade gifts. My grandfather made a baby bed and my grandmother made a pillow, mattress, and quilt for the baby bed as a gift for my little girls. Within two years, both of my grandparents passed away, yet we have these sweet gifts that my daughters play with every day. The best handmade gift I’ve ever received was the needle point my grandma made for my first baby’s nursery. It’s of a quote she had hanging in her babies’ rooms when they were little. Totally priceless and perfect. My girlfriend crocheted a scarf that I wore all winter!!! Homemade gifts are the best! I thought of her all winter while I was wearing it! ???? The best handmade gift I have received honestly, was my daughter’s first picture she made for me with paint. I remember my mom saving a few of my art “masterpieces” as a child and I couldn’t wait to get my first one as a mom. I will never forget the doll clothes and quilt my grandmother made me when I was 7.
the best handmade gift i received was a blanket my grandmother made for me the christmas before she passed away. it’s starting to look a little rough, but i just can’t part with it. The best handmade gift I received was a tote bag which I continue to use for work and school. My daughter will love making thse for her friends! A wall hanging using Asian prints (and a French apple tart). The best gift was the double wedding ring quilt. From my husband’s aunt, I love it. Love this giveaway! My fave handmade present is the painted plate my nieces gave me. My favorite handmade gift, is a vase that my kids painted for me. A quilted wreath from my sister. Thanks for a great giveaway! November is a great month for a chance to win a sewing machine. Best handmade gift I’ve received? My sweet brother-in-law made me a framed outline of the state of Oklahoma that reads “OklaHOMEa” before we moved. It was an emotional move, so it meant a lot to me. My mom made me a great afghan that is the perfect size for curling up on the couch. The best handmade gift I received was a necklace from my sister. I like chunky beads. The necklace kept breaking on her until she reinforced it. Knowing that the spent hours on something to make me smile is why I love it! How fun for little add-in gifts! Thank you for sharing the tutorial. My late Aunt always made our Christmas gifts. It was so exciting to see what she did every year as she was always learning new skills. It is difficult to choose but My favorite gift she gave me was teaching me to be creative.